Sanskrut/Sanskrit is the backbone of Indian history, mythology, literature and what not. It is a language that, in spite of being a powerhouse of knowledge, is dying in India. Even the name of our nation came from Hindustan, meaning a place where Hindus live. To begin with, let me tell you the meaning of this word. Every word has a meaning, so does this word. ‘sanskrut’ is made up of two different words, ‘sans’ which means good in sanskrut & ‘krut’/’krit’ which means work in sanskrut. So, the meaning of this language itself teaches us a lesson. The meaning of this word is more than just a name of one of oldest languages in the world. Instead, it is a lesson that you and I should learn. Any good deed you do is called ‘sanskrit’. Apart from being one of the oldest languages in the world, Sanskrit is the biggest language in the world. It has over 350,000 words in its vocabulary. However, there are a lot of theories going on depicting a lot of variations in the number of words. I’m mentioning this figure because this is the most legitimate figure that came out upon my research. Each of its meaning might mean same, but each of the words has a ‘concept’ behind its existence, which is found in no other language. Other languages have a meaning of the words in its vocabulary, and not the concept of the meaning. Sanskrit is most systematic language in the world. Each of the words in this language has a concept. For example, there are 129 words meaning ‘theft’ in sanskrut. Reason? There are 129 types of ‘theft’ or ‘stealing’ recognized by the Indian literature. Each word depicting each type of stealing. Each word in this has a number as the following image, which comes to a total of 54, which further results in the number 9(5+4=9) which is the date of birth of lord krushna(as per Hindu calendar) though, lord krushna’s birthday is celebrated on ashthami, his actual birth is celebrated at midnight which changes the date. Even this turns out to give the total of 54, which further gives the number 9. Same as Krushna. You can do the same thing with “Ram” & “Sita”, this couple also has the same number 54 respectively. Another noticeable thing this very practice tells us is the fact that there are 108(54+54) beads in the mala of the Indian mythology. Which means, if you recite lord’s name 108 times, you are blessed with reciting both their names. Another side of this is also a fact that the couples name is irreparable. We all know Ayurveda and yoga are connected with sanskrut at foundation level. Hence the rushi-munis who were behind the formation of this language dissolved the best and easiest yoga practice in the pronunciation of certain words. For example, the word देवः has the visarg ha (:) at the end. While you pronounce this word, the sound of ha (:) known as visarg originates from your diaphragm, travels through your lungs, then the windpipe, the sound box and then your tongue and at last comes of your mouth. This exercise has a lot of health benefits, as it clears out a lot of dirt on its way out. This is the practice behind the ‘pranayam’. It pushes out the air you’ve breathed in with a force and the dirt the sound cleared on its way out. So everytime you pronounce words like देवः & देवीः helps you actually do ‘pranayam’, everytime you pronounce it. The phonetics of any sanskrit word will make you healthier. Isn’t it amazing? Speaking a language as an exercise? A lot of hype around this fact is taking over the internet. But the root cause of this is not recent, it dates back to 1985. Then, a NASA scientist, Rick Briggs shared a paper on how Sanskrit can be a great way to train computers. The reason is the fact that Sanskrit is the oldest language and almost all languages are derived from it. So it’s the natural language for humans. The idea was to use the natural language, the primary source of human communication. To this, Sanskrit suited the best. However, as the computers evolved, it started understanding many languages that humans speak. But at the foundation, lies Sanskrit. We were invaded by Portuguese and French in past but they couldn’t survive. We have a very very very rich culture of our language. On average, for every 20,000 villages, India of that time had 19,200 ‘gurukuls’. Upon knowing this, they decided to steal the language from us hence paralyzing our existence. They were really smart to make this move. They demolished gurukul culture and marketed the convent schooling system in such a way that it looked like a luxury and soon we lost trust in gurukul culture and they ruled us for over 200 years. Isn’t it a matter of shame that they could figure out the power of culture and we couldn’t? A lot of us already know, what this letter means in Hindu mythology. Most sacred word in human history, it is said to be the first word originated from the toe of Brahma. The first word Brahma heard before creating the mankind. Many theories also say that the radiation that sun produces have a cracking sound (of gas particles bursting due to high pressure and temperature) produces this sound. Leaving all these as just unproven theories, let me tell you the mind-blowing fact of this very word. This very letter is a combination of three letters, अ ऊ म. Each of these letters denotes Brahma, Vishnu & Mahesh respectively. Furthermore, as per Hindu mythology, each of the three has a role to play, which are: Generation/Creation, Organizing/Maintaining & Destruction respectively. This is adopted by the English Literature, as their mythology also has the mention of these three things as the major role of the Almighty. Hence, giving the name Generator(G) – Organizer(O) – Destroyer(D), GOD to the almighty. 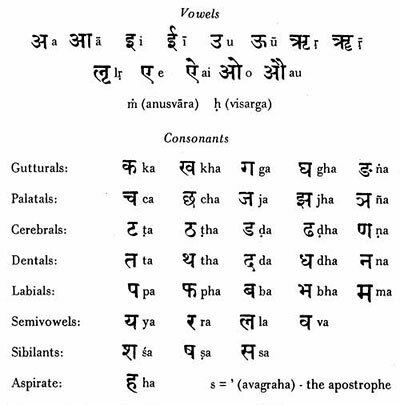 Sanskrit is the only language in the world whose words are pronounced exactly as the way they are written. Therefore, it doesn’t matter which country you belong, which accent you use, You will pronounce the Sanskrit words exactly the way it should be pronounced. Any word is written exactly the way it’s pronounced and it’s pronounced exactly the way it’s written. No other language in the world is capable of doing this. Take a look at this video, foreigners reciting Sanskrit shlokas. A lot of people has this misconception that Sanskrit is all about spirituality and god stuff. No! It is not. 95% of the manuscripts that are found so far are not at all on spirituality. It has science, it has mathematics, it has chemistry, physics, biology, health care, astrology, technological information that we can only imagine today and what not. There’s a reason why Indians who were studying in Gurukul, were so brilliant at everything. The knowledge that those manuscripts have a mine of knowledge that we have left behind. Sanskrit has knowledge on all modern day profession, archery, body-building, wrestling, swimming, you name it. Again, it’s NASA in the scene. NASA has been researching over 60,000 manuscripts written on palm leaves to study the technological advancements that we cannot even imagine. 1 mile is 1.6km, so 9,60,00,000*1.6 is 15,36,00,000km. NASA estimates the distance to be 15,0000000 km. This figure came out a few years back, but our literature had it thousands of years back. Amazed why NASA is interested in Sanskrit manuscripts? The University of Harvard, Oxford, Indiana, Cambridge are few of the many universities that teach Sanskrit. Furthermore, German universities are unable to fulfill the demand of students wanting to learn Sanskrit. They’re running short of resources who can teach. A very few Indians even know Sanskrit, let alone teach it. Sure, we know the existence of this amazing language yet disown it. If we spin back the time wheel and do what we did just a before we were colonized, we’d be the best nation by every means. The knowledge that our culture has to share is more than enough to be the best at everything. You know the best part? The teaching is never outdated. In fact, modern day technology is learning from the so-called ancient tech. It’s high time we rely on other sources to learn what we already have in tradition. Share this if you feel proud of having born in such a rich tradition. Show the rest of the world what you and I possess and spread the awareness. Make sure you subscribe to my mailing list where I share exclusive stuff.